Is it a blessing or a curse? 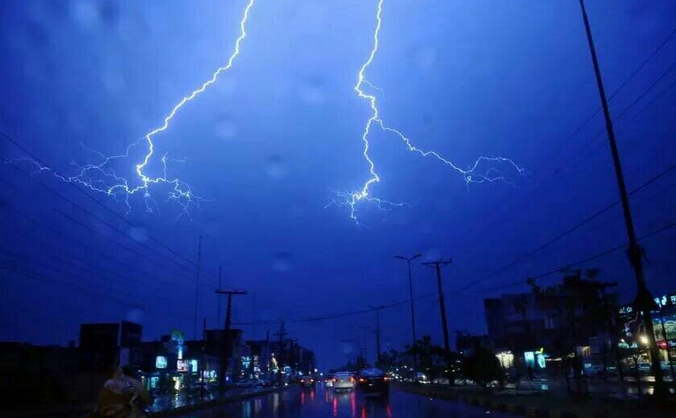 On May 12, 10 people lost their lives in the Punjab province as fierce windstorms and thunderstorms battered Lahore, Faisalabad, Multan and other cities. On May 14, a second wave of the ongoing unusual rain hit southern parts of the Pakistan particularly the Sindh province where deadly dust storms and heavy downpour claimed four lives while 40 were injured. May is the hottest month in most parts of Pakistan with little rain that mostly falls in the northern areas of the country. However this May has been wetter across the country with low temperatures which is a big blow for the Pre-monsoon heating. May 15, 2014 in 2014 Pakistan Weather, 2014 Punjab Flood, 2014 Sindh Weather. Pakistan Weather Update & Monsoon Alert (August 20 – September 3) – Updated on August 27! ← Pakistan Weather Update (May 10 – May 17): Unusual Widespread rain at doorstep! Although the temperature is lower than normal across subcontinent, then why the monsoon is expected to hit Kerala couple of days earlier than expected date i.e. 1st of June? The Indian skymet, private department says that it can hit early but the IMD, government department believes there would be a delay. As global warming increases, the chance of floods in Pakistan will increase, especially when moisture comes from unexpected direction, like the South American moisture that hit Mecca last week via Central Africa. The weather can be unpredictable due to climate change. Its evident that in may we are not going to see temp beyond 40 degree Celsius in Islamabad Can we expect pre moonsoon to be late in Islamabad as premoonsoon heating is not there? Its not necessary to get pre-monsoon there has been monsoon seasons in which there were no pre-monsoon rains in the country, we got direct monsoon rains. Temperature can reach 40 or slightly beyond during late May. AoA Babar, like craig said the current weather systems are coming from unexpected directioncoz of global warming, is there any possiblity these western systems could persist in coming months as well and creats unusual rainy season by joining hands with eastern systems? Western system occurs in northern Pakistan almost every month. Yes we have seen the interaction between eastern-western systems which result in extremely heavy rains usually leading to floods eg 2010 Pak floods and 2013 India floods. Dr. Hanif reported 80-100 km/h wind gusts along with these storms! Definitely makes it a severe thunderstorm by all means. Lightning was blamed for most deaths. very unfortunate!